Why, yes. I am the Nonfiction Monday host this week. Please leave your links in the comments and I’ll update this post during the day. 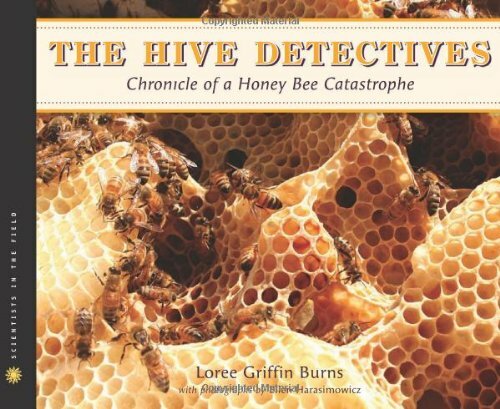 For my part, I’ll be talking about The Hive Detectives: Chronicle of a Honey Bee Catastrophe, by Loree Griffin Burns. I specifically didn’t use the word “review,” as I don’t think that I can fairly review a book that I’ve followed from the beginning research to book reviews to photo choices to title selection and onward to the publication celebration. I feel like I’ve watched this puppy grow up in front of me, and I’m just so darn proud. As it turns out, you take the topic to kids by bringing them along on the research. Letting them meet a beekeeper, inspect a hive, visit an apiary, and autopsy a bee all through the magic of words and photography. And boy, is a photo of a cut-up bee magical. As readers begin to unravel the mysteries within Colony Collapse Disorder, they are gaining a general knowledge about bees, honey, and pollination. They are also learning about scientists and how they do research on difficult topics. It’s like two books in one! At the end of the book, the mystery of Colony Collapse Disorder remains unsolved, but the importance of bees — and science — is indisputable. Nonfiction author Connie Goldsmith returns as Guest Blogger at Word Playground to share some of her writing experiences, as well as a mosquito bite or two that will prompt you into active writing! Look for a bunch of puberty books for boys over at Pink Me. Read about Pelé, King of Soccer, by Monica Brown over at A Wrung Sponge. They Called Themselves the K.K.K. is reviewed over at Bookish Blather. Rasco from RIF re-read an older alphabet book that is a favorite of hers and of the children with whom she has shared it: The Accidental Zucchini, An Unexpected Alphabet, by Max Grover. Take Just One Bite over at The Well-Read Child. Visit Simply Science for You Can’t Wear These Genes, by Shirley Duke — her first nofiction book! Looking for an exciting book for reports or pleasure reading? Check out the review of Captain Mac: The Life of Donald Baxter MacMillan, Arctic Explorer, by Mary Morton Cowan, at The Fourth Musketeer. Fall is the perfect time for Zero is the Leaves on the Tree. Read about it at over at A Novel Idea. Abby the Librarian is taking us Inside Tornadoes, by Mary Kay Carson. And just so cool, the author of the book above has a review of her own of Orangutans are Ticklish with fun facts from an animal photographer at Wendie’s Wanderings. Apparently Three Turtles and Their Pet Librarian have the text from these rhyming food group books stuck in their heads now. Curious? Ah, science fair season. Perfect time to check out these books from the Science Fair Winners series from National Geographic at Wrapped in Foil. Bookends has two books to share: Blue Everywhere and Does an Apple a Day Keep the Doctor Away? Looking at They Called Themselves the K.K.K. : The Birth of an American Terrorist Group at SLJ’s blog Practically Paradise. It’s all about Disasters! over at Biblio File. And Charlotte’s Library goes Supernatural. With Halloween just around the corner, it's a perfect time for Steve Jenkins' book, Bones as reviewed at Books Together. The Bee book looks fascinating! I will have to look for it. I used to enjoy reading the book Ned Kelly and the City of the Bees by Thomas Keneally with first graders and they loved it. I am in with a post about Pele King of Soccer by Monica Brown. Thanks for hosting! What an interesting sounding book - and it's kind of cool you've been able to follow it from research to publication! I have been intrigued by the bee book as I come upon the various articles discussing it; your post is a special one, thank you; as well as "thank you" for hosting Nonfiction Monday this week! I re-read an older alphabet book that is a favorite of mine and children with whom I have shared it: The Accidental Zucchini, An Unexpected Alphabet by Max Grover. Happy Reading, happy week to all! I think my little one would really enjoy The Hive Detectives, especially the photo of the cut-up bee. Is the bee book one of those Scientists in the Field books? That series has yet to produce anything but fantastic NF. At this point I'm ordering them for my libraries sight unseen, and I hardly ever do that. I am writing about the strangeness of real life, as I teach and run a boarding school library in Africa . . .
Hi, today I have a review of a biography for young people: Captain Mac: The Life of Donald Baxter MacMillan, Arctic Explorer, by Mary Morton Cowan. This is an exciting book for reports of pleasure reading. Thanks for hosting!! I review 'Zero is the Leaves on the Tree' over at my blog, A Novel Idea. Today for NFM, I've got a review of INSIDE TORNADOES by Mary Kay Carson. We have a review of What Holds Us to Earth? A Look at Gravity by Jennifer Boothroyd at Wild About Nature blog. Bees are such fascinating little creatures! My selection is The Halloween Book of Facts and Fun, written by Wendie Old and illustrated by Paige Billin-Frye. Thanks Janet, for reviewing my Halloween book. It was fun to write. My review today at Wendie's Wanderings is Orangutans are Ticklish, fun facts from an animal photographer. Hive Dectectives is definitely a great book. I'm glad it go nominated for a Cybils. just in time for science fair season. is reviewing two books, Blue Everywhere by Kristin Sterling and Does an Apple a Day Keep the Doctor Away? Today I am focusing upon They Called Themselves the K.K.K. : The Birth of an American Terrorist Group at SLJ's blog Practically Paradise. I'm in this week with a book on Disasters! And checked out Hive Detectives to read tonight. I'm in with Supernatural, from DK. Thanks for hosting! And I know you'll appreciate another example of faulty reporting from the New York Times, who recently and apparently prematurely reported that the bee crisis is solved (http://www.nytimes.com/2010/10/07/science/07bees.html?_r=1). I'm in with a review of Steve Jenkins's Bones. Boo! Sounds like an interesting book, thanks! I'm so happy you blogged about The Hive Detectives...at my work, it was one of the employee book club selections. You could tell we all really enjoyed the book because there were non-stop facts being shouted out throughout our discussion. I love that a science topic could be so well explained without the intimidation of academic jargon. What a great classroom resource!